Our Annual Dance for 2018 took place on Sat 20 October in the Bridge Community Centre in Newark. Dancers from around the region joined us and danced to the music of Neil Barron and his Band. It was the first time we had used this location for our Annual Dance and the first time we had invited Neil; the result was a great success! Our Annual Dance in 2019 will take place on 19 October, again in the Bridge Community Centre; on this occasion we are very pleased to be inviting Ian Slater to play for us. Ian is one of our regular musicians and we always look forward to dancing to his music and inviting other dancers to join us. A programme will be available here a few weeks before the Dance. Please add the date to your 2019 diary now! Our next Charity Ball is on Friday 13 December 2019 at 7.30pm in the Georgian Ballroom in Newark Town Hall (postcode NG24 1DQ) when we will have George Meikle playing for us. Further details will be available here in Autumn 2019. 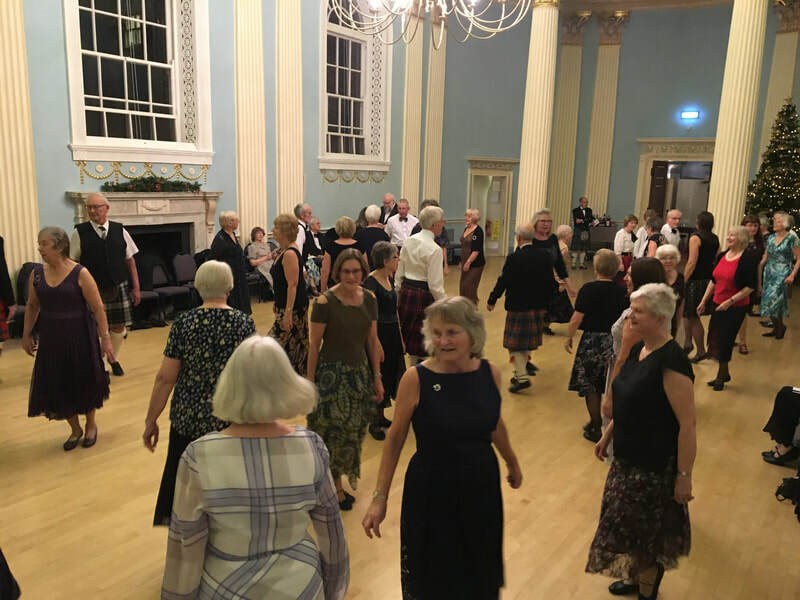 ​The weekly classes during the weeks of St Andrews Day (30 Nov) and Burns Day (25 Jan) are an opportunity for members to raise money for a Charity close to their heart. The Society matches the sum raised during the evening up to a maximum of £100. St Andrew's Day Charity Social 2018 - Tuesday 27th November. No single Charity was chosen, so donations were to be added to NSCDS's three chosen Charities for this year. Cakes enjoyed during the interval raised £142 with NSCDS adding £100, making £242.00 to be divided between Lincs and Notts Air Ambulance, Reach Learning Disability and The Children's Bereavement Centre. Burns Charity Social 2019 - Tuesday 29 January. Charity: Cancer Research UK, organised by Jean Martin. Cakes brought along by members to buy during the interval raised £153; NSCDS added £100, making a total of £253.00 for her chosen Charity! The Reel of the 51st Division, danced during the 2019 Burns Charity Social, by a (almost all) men's set! Our next Day School will take place on Saturday 18 January 2020 in the Bridge Community Centre, Newark (postcode NG24 2DQ). The Day School is organised to address the needs of less experienced dancers needing to gain confidence, as well as dancers who are already familiar with basic figures. Our guest teacher for 2019 will be William Williamson. 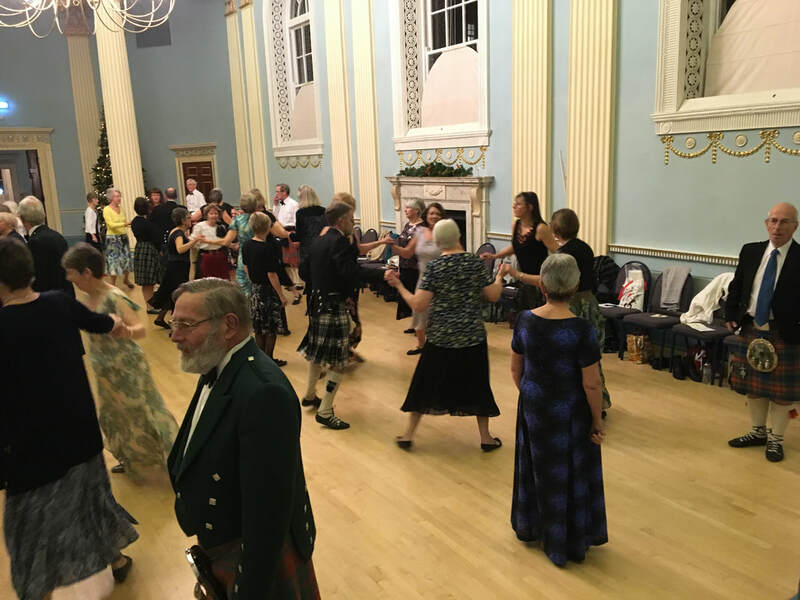 William is a long time member of the Dumfries Branch of The Royal Scottish Country Dance Society and has taught at the Society’s AGM, Winter School, Summer School and many events around the world. William will be supported by Ian Robertson on accordion. Ian is a full-time musician with a busy schedule playing for Scottish Country Dancing internationally, and has often played for William when he has been teaching at Day or Weekend Schools. After playing for the Day School, Ian will play for the evening Dance. There will be classes in the morning and afternoon, and a buffet lunch. The morning session is for beginners, as well as those whose aim is to improve steps, dance technique and gain confidence in dancing basic formations. The afternoon session is for more experienced dancers who have a secure knowledge of the basic formations, including reels (of 3 and 4) and who can identify corners positions. This knowledge will be assumed so that the teacher can concentrate on developing further skills. Several of the figures taught will be from the evening Social Dance programme. The expectation is that all participants will wear footwear appropriate for Scottish Country Dancing ie ideally ghillies or ballet style shoes, for the safety of all taking part. Shoes with hard soles and heels will not be permitted. There will be a limit on numbers, with a waiting list implemented if necessary. An application form will be available in Autumn 2019. ​The evening Dance will held after the Day School, on 18 January 2020 in the Bridge Community Centre, beginning at 7.00pm. We are very pleased that Ian Robertson, the musician for the Day School, has agreed to play for us in the evening. The dance programme is devised with those who attended the Day School in mind; some dances taught during the day will be included. A flyer, giving details of the dance programme and a link to the cribs, diagrams and videos, will be available in Autumn 2019. 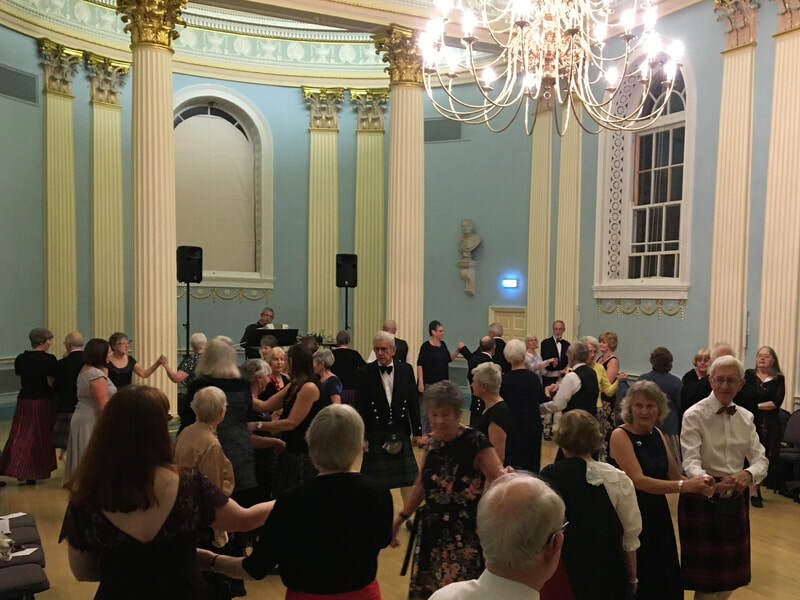 The Festival is organised by the Association of Scottish Country Dance Societies to promote Scottish Country Dancing, particularly in the East Midlands. In 2019, it will be held in Retford on 11 May with music performed by Alan Ross and his Scottish Dance Band. Each year, the Newark dancers enter a team to participate in the Massed Dancing and a team to perform a demonstration solo watched by the other teams. The programmes for the massed dancing in the afternoon and for the evening Dance are attached below, along with minicribs for the evening. Words, diagrams and videos can be found by clicking on ASCDS Festival 2019 - Massed Dances (afternoon massed dances) and ASCDS Festival 2019 - evening dance (evening Dance). On Tuesday evenings during the summer, dancers host Garden Dances in their own gardens for other members. In the event of inclement weather, the dancing takes place in the usual hall in Newark. Three of the 2018's sunny summer evenings are shown below.